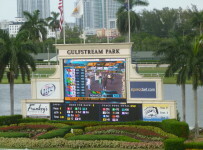 Here are the highlights for today’s racing at Gulfstream Park and at Tampa Bay Downs. At each track, conditions are fast for the dirt and firm for the turf. Gulfstream has an 11-race card today with first post of 12:35 p.m. The main attraction is a carryover of $2,273,704 on the Rainbow 6. The bet is 20-cents only per combination and requires picking the winners of the last six races. Details may be found on our blog in a posting from Thursday evening “Rainbow 6 Carryover is Just Under $3 million. 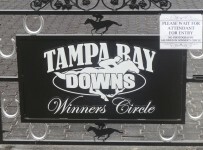 Tampa Bay has ten races today, and a first post of 12:25 p.m.
Later today and tomorrow morning we will have previews of the tracks’ Saturday race cards. Gulfstream will have three graded stakes. 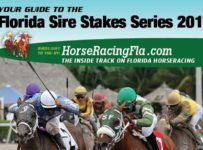 *$500,000 Gulfstream Park Handicap (Grade 2) – one mile on dirt, 4-YO and up. On Saturday, Tampa Bay will have the 2015-2016 meet’s final two races in its annual Tampa Turf Test series. One race is for males 4-YO and up and the other is for fillies and mares 4-YO and up. Both races are starter handicaps at 1 3/8 miles with $26,000 purses. They are restricted to horses that have raced for a claiming price of $16,000 or less in 2015 or 2016.